This post is part of a series in which Influencers share lessons from their youth. Read all the stories here. Each year for a few days in May, age gets to bestow its wisdom on youth and anyone who's over 22 has advice for anyone who's not. Youth may roll its eyes and shrug, that wisdom nonetheless lives on in a corner of the mind, often to be dissected and understood much later in life. This week and next, that wisdom also lives on LinkedIn, where 80+ of our Influencers – the top minds in business in every industry from retail to media, tech or healthcare – share lessons from their youth and what their few more years of life can teach the class of 2014 and every young professional. Let's get that #1, best-seller intimation out of the way first: follow your bliss. There are two camps. "If I were 22, I would find what I love to do and do as much of that as possible," writes Jordy Leiser, cofounder and CEO of StellaService. A sentiment echoed by Jonathan Bush, now CEO of athenahealth. Son of a financier, nephew of a U.S. president, he climbed the corporate ladder because it was the thing to do, but he never felt more alive than that summer he spent driving an ambulance in New Orleans. "The biggest lesson I’d like to bring back to my 22-year-old self is to let my passions lead my career choices," Bush writes. "Everyone says they need a real job, but you can define what is real and worthy." In that vein of sobering advice, Sallie Krawcheck, who went from young marketer to research analyst to Wall Street CEO to owning a women's network, warns you'll have to kiss a lot of frogs before finding the right job. Accept that nothing you plan for ever quite turns out as expected and that you yourself will change. Dare to dabble, says CNBC correspondent Julia Boorstin. "You never know what you'll enjoy doing until you actually do it," she writes. In fact, we quizzed our participating Influencers in this series: 86 percent said they're doing something now they never imagined then. There is wisdom and freedom in that uncertainty, adds Deepak Chopra. In youth, none of the traps of conformity and circumstance have closed. One of those traps is believing that status, money and long hours make success. You really shouldn't worry about making money beyond assuring a comfortable life, says Suze Orman (yes, the personal finance expert! ), who recounts losing herself in consumerism in her 20s. "For far too long, we have been operating under a collective delusion – that burning out is the necessary price for achieving success," adds Huffington Post founder Arianna Huffington. "In college, just before I embarked on a career as a writer, I wish I had known that there would be no trade-off between living a well-rounded life and my ability to do good work." And famed Indian entrepreneur Ronnie Screwvala wishes you'd stopped looking at the Mark Zuckerbergs of this world as the picture of youthful success – they're outliers. You won't make your first million, let alone billion, in your 20s, but you can take steps toward future success and fulfillment (he's in the passion camp, by the way.) "Most successful men and women across the world took their time to win the world over," he says. But youth has of course nothing but time and very little patience. It is a time to want everything, to seize every experience with insatiable hunger, to "have an absolute blast," as Richard Branson – the expert in keeping one's youthful spirit at 60+ – puts it. That's not to say you shouldn't be purposeful – and here General Stan McChrystal chimes in with a powerful take on the meaning of service – but you can build something and give back while enjoying your youth, says Branson. Redballoon founder Naomi Simson laughs now at how serious and intense she was as a young woman. Work won't remember that weekend you did or didn't spend there, she writes. Your friends and familly will remember that weekend you bailed on them to please a boss. "Make sure you have the time of your life, stay up for plenty of sunrises and meet all kinds of people in as many places as possible," Branson advises. "If you get the opportunity to travel, grab it with both hands." Here he joins UN Secretary-General Ban Ki-moon and World Bank president Jim Kim, whose current international jobs are no surprise when you read what they did in their 20s, respectively traveling out of a tiny Korean village to meet President Kennedy and serving as a humanitarian in Haiti, Peru and Siberia. There's a feeling you only know in your early 20s, one you thought would never go away – how could it? It's you! – until you reach 30 and realize it has. "The instinct to be free is very strong when you're young," writes Deepak Chopra. "The flame of discontent is still fueled by idealism." Hold on to that, advises Frank Wu. But that's a post for next week, when this series continue. For now, read these and 50+ Influencer posts right here. And share your own advice for today's young professionals: what do you know now that you wish you'd known then? What are you telling your own graduating kids? If you are 22 or close enough, what is your take on the future? 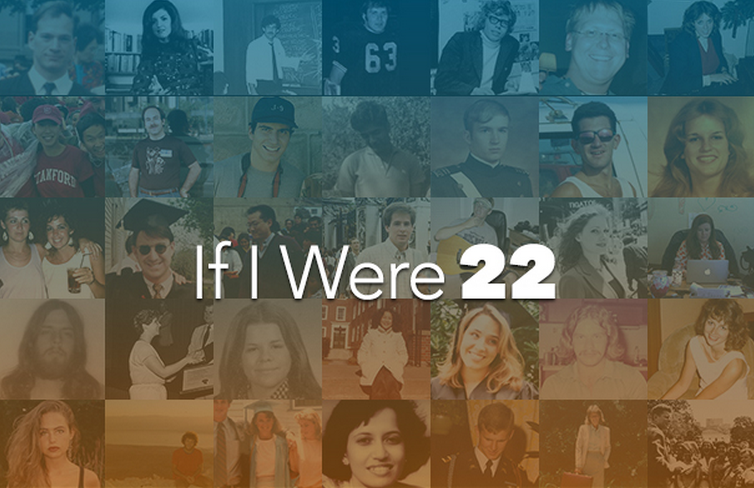 Write a post on LinkedIn and use the hashtag #IfIWere22 somewhere in the body of the text. (Want to write, but don't yet have access? Leave your info here.) We look forward to reading your words of wisdom.